The restaurant industry is its own ball game when it comes to social media. You’re not selling shirts online nor are you a service looking to acquire leads that you can hopefully convert into a sale. Your restaurant sells a meal and an experience that only lasts for the moment the customers are enjoying it- meaning the value of the product is momentary. Your customers don’t come to buy something they can take home and enjoy for years to come. They come for a happy experience that will satisfy their hunger. Your social media marketing strategy should reflect these goals! The same digital marketing strategy that works for a car dealership is not necessarily going to also work for your restaurant. So, don’t settle for cookie-cutter marketing when it comes to your restaurant’s social media. Due to the nature of how restaurants operate and how they acquire revenue, it can be less obvious of how to go about creating a social media strategy for restaurants. More specifically, it can be difficult to navigate restaurant Facebook ads. What are we tracking if we aren’t selling a product online? How does online advertising translate to in-store foot traffic? How is Facebook going to impact the amount of people coming to dine at my restaurant? These are common (and good!) questions to ask when it comes to running restaurant Facebook ads. So, then the true question is: How do you use restaurant Facebook ads to your advantage? Well, today we’re sharing our expert tips to help you cook up the results you’re looking for with restaurant Facebook ads! These tips will include the why and the how-to behind each point to set your restaurant on its way to success. And you can also check out how we help our other restaurant clients! You’ll see a lot of the tips and strategies we use there and the suggestions given here overlap – because they actually work! Brand awareness is absolutely everything when it comes to marketing your restaurant online. Whether you’re a fast food place, a dine-in restaurant or a drive-thru ice cream joint — you’re not going to acquire new business if nobody knows you exist or where you’re located. Facebook has an engagement ad campaign that specifically optimizes for “page likes.” If you’ve never heard of Facebook page likes before, just think of them as your Facebook page’s followers. This is one of several restaurant Facebook ads we’ll suggest in this blog, but this is a crucial part and is at the top of the funnel. Running a Facebook page like ad campaign falls within the 01 Awareness stage. And it’s necessary in order to fuel stages 02-05! Gaining page likes will not only help people in your area to know you exist. But it will also help garner a trust for new people down the road. Think about your own experience with Facebook pages. If you see a Facebook page that has 20 likes, is pretty bare and has no reviews, then your immediate response is to keep scrolling. Because why give it any attention if no one else is, right? But if you come across a Facebook page that has thousands of page likes and strong post engagement, it just might peak your interest enough to give it a like too! When you’re creating your page like ads, just remember that they have a limit of 90 characters. So you’ll want to convey the vibe and offers of your restaurant quickly. Another great way to generate brand awareness is to boost posts. Boosting posts means putting advertising dollars behind the posts that are on your Facebook page. Boosting posts is another great way to run restaurant Facebook ads. You can boost posts specifically to people who have already liked your page, or you can boost posts to an entirely new audience. Therefore reaching new people and expanding your brand awareness. Here’s the main difference between boosted posts and page like ads. Page like ads have a 90 character limit and optimize for page likes. Meaning Facebook shows the ad to people within your target audience who are likely to like your page upon seeing the ad. This likeliness is based on their past behavior. Boosted posts don’t have a character limit and optimize for post engagement as opposed to page likes. Essentially, page like ads are an ad campaign that run for a designated length of time. And boosted posts are more of mini promotions that you can run for only a day or multiple days. Have you ever seen a Facebook page with 3 followers have hundreds of likes on a post? It’s because they boosted it! Remember earlier when we said that people who like your Facebook page will see a percentage of your posts moving forward? That’s true, but it’s a very small percentage, unless you boost posts! Boosting your posts to your existing page like audience and to new people alike allows more useres to see your post than if you hadn’t boosted it. And it generates that extra buzz about your business that might just get you more customers in the door! Specifically for restaurants, sometimes all it takes is seeing a juicy sandwich in your Facebook newsfeed right around 11:30am to make you ditch that lunch you brought to work! Speaking of which, let’s talk about the creatives in your restaurant Facebook ads. Now that we’re gaining followers with page like ads and helping more people see our posts with boosted posts, let’s take a look at what we’re showing them! Photos are an important part of any advertising campaign. But they’re doubly important in the restaurant business. You could have all of the bells and whistles with live music, prime location and special deals, but if your food looks gross in a restaurant ad…let’s be honest, who is going to want to eat there? See what the difference in image quality can do to your appetite? Investing in your photos in the restaurant world equates to investing in your sales. And when we talk about investing, we don’t necessarily mean money! You can honestly take a great photo with your iPhone and just invest the time to edit it properly. The reason we say this is because your customers do it all the time! Just search the hashtag #foodofinstagam and you’ll see what we mean! This is another great way to spread word-of-mouth for your restaurant: using customer photos to your advantage. Let’s take a look at one of the restaurant clients we currently work with whose account we’ve managed for a couple of years now. We almost exclusively use customer-tagged images for their Instagram, Facebook & Twitter. And as you’ll see in the post above, we always credit the original user who uploaded the image and tagged the restaurant. Now let’s say we were to put money behind this post and boost it. Not only are you getting more engagement, but you’re also putting money behind a testimony. In the particular post above, we were highlighting National Chicken Month because this restaurant is known for its fried chicken. But in some of our posts, we include not just the user’s image, but also their caption. See below. Putting money behind a post like this is powerful because you’re accomplishing so many goals with it. 1. You’re making people hungry with the image alone. 2. You’re spreading brand awareness that your restaurant exists. 3. And you’re implementing trust that other people love to eat there. If customer testimonies aren’t an option, then make sure you spend extra time building a copy that will make your customers hungry just reading it! Replace generic adjectives like, “delicious, good, tasty” with “juicy, tender, and zesty!” You want your customers to be able to envision exactly what they’re missing out on if they don’t dine in with you. Now that we’ve got our ad creatives down, and we know what kind of ads we want to run to generate awareness, let’s talk about who we’re showing these ads to. Targeting the right audience with your restaurant Facebook ads is key to getting the most bang for your buck! Let’s start with some of the obvious points. When setting up your target audience, be sure you target within a reasonable mile radius of your location or locations. There’s no sense in targeting people in Florida if the only locations you have are in California. It’s a waste of money. 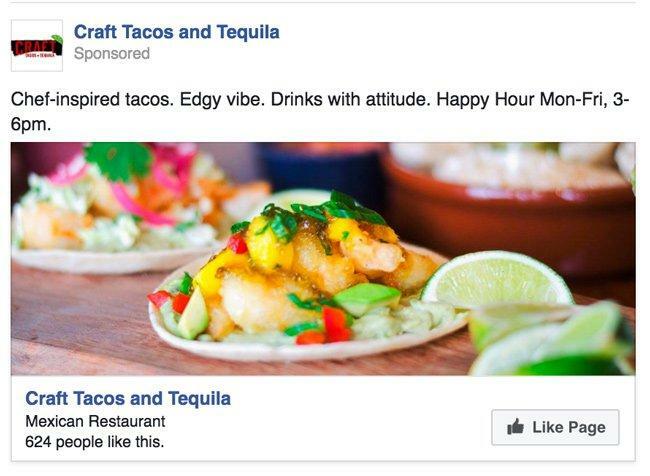 If your ad copy or image implies having an alcoholic beverage, you’ll also need to make sure you’re targeting people 21 and older so as to avoid getting the ad disapproved by Facebook. After that, you’ll want to start thinking about interests and behaviors your audience is likely to have that you can target. For instance, if you serve BBQ, consider looking at other places that serve BBQ in your area and seeing if you can target their followers! If you have an email list of 1,000 or more from your existing customer base, you can also upload that list into Facebook to target them directly and/or create what’s called a lookalike audience of them. A lookalike audience is exactly what it sounds like. It’s an audience that looks like the original audience. So if you upload 1,000 or more emails and tell Facebook “This is what my customer base looks like. Find more people who look like my customers,” that’s exactly what a Facebook lookalike audience will do. Having 1,000 emails is not a minimum requirement set by Facebook, but more so a suggestion from your friends at LYFE Marketing. The larger the original list, the more accurate the lookalike audience will be! You’ll also want to implement retargeting. Retargeting can include a multitude of audiences: website traffic, post or ad engagement, your existing customer emails etc. Retargeting in general just means showing your ad to an audience that is already familiar with you in some form. Staying in front of your customer base online will help them think of you the next time and they’re out and could use a bite to eat! This last tip is a big one and has been a game changer in recent years for restaurant Facebook ads. While the end goal for restaurants is to have in-store diners – online orders, be it through a website or a mobile app, are very much trackable and can equate to direct revenue! Let’s start with mobile apps. You’ve probably noticed big chains like Chick-Fil-A or Starbucks promoting their apps. They give their customers great incentive to download them by offering a rewards plan. Generally, if you pay through the app, you get so many points per dollar. Once you acquire enough points, you get a free sandwich or drink. The reason this matters is because there is an entire Facebook ad campaign specifically optimized around app installs. Meaning it shows the ad to people within your target audience who are likely to install an app on their phone based on their past behaviors. If you offer coupons through your mobile app, or if people can purchase orders directly through your mobile app, it could be extremely beneficial to your restaurant to run Facebook app install ads! This campaign would allow you to very clearly track how many people install your restaurant’s mobile app as a result of seeing your restaurant Facebook ads! Now, let’s say you don’t have a mobile app for your restaurant. But you do have a website that allows people to place a to-go or pickup order online. You could run a Facebook conversion campaign that tracks how many people place an order upon seeing your restaurant Facebook ads! Conversion campaigns do take a little bit of extra setup given you have to install the tracking pixels on your website in order to enable purchase tracking. But if it’s too complicated for you, you can always have us do it. We’d love to help. Both the app install and conversion campaigns give you something very tangible to track, expanding your social media strategy past brand awareness. And if you’re able to track online pickup orders, that’s direct revenue for your restaurant! Running restaurant Facebook ads can be a little bit trickier than it is for other industries. But that doesn’t make it impossible. With the right, custom-tailored strategies in place, your restaurant Facebook ads are sure to take off! Contact us to learn more about how we can help your growing business! This article definitely highlights the advantage of using Facebook Ads.